A Business Improvement Area (BIA) is an association of commercial property owners and tenants within a defined area who work in partnership with the City to create thriving, competitive, and safe business areas that attract shoppers, diners, tourists, and new businesses. By working collectively as a BIA, local businesses have the organizational and funding capacity to be catalysts for civic improvement, enhancing the quality of life in their local neighbourhood and the City as a whole. Toronto now boasts a total of 85+ BIAs across the City — the largest number of BIAs in North America — representing more than 35,000 businesses. Together, they generate more than $34 million in funding towards street and sidewalk beautification, marketing and promotional campaigns, street festivals, clean street/graffiti-removal campaigns, and crime prevention strategies. BIAs also act as a unified voice to address issues on behalf of their membership. To learn more click here. The Board of Management, Members and Residents make up two BIA sub committees; the Marketing Committee and Streetscape Committee. The size of each Board of Management, and the number of citizen members and Council members on each BIA Board, is set out in the City of Toronto Municipal Code: Chapter 19, Business Improvement Areas. VACANCY – Contact the office to find out how you can join the Board of Management. Every business/property member is charged a portion of the annual budget, based on that member’s share of the BIA’s total commercial realty assessment. Each year the Board, along with member input via an Annual General Meeting, prepares annual budget estimates that must be submitted to municipal council for approval. Once the budget is approved by municipal council, the council adds a special levy to the property tax paid by every owner of property designated (member) as industrial or commercial within the boundaries of the BIA. For each property, the amount of the levy will be related to its realty assessment. The exact amount of the BIA levy is determined by dividing the property’s realty assessment by the total realty assessment in the BIA and multiplying by the total BIA annual budget. AM I A BIA MEMBER? If your commercial property, business and/or organization falls within the BIA boundaries as defined by the City of Toronto (below), then yes you are considered a Member and can benefit from many Member perks, this may not however mean you are a paying Member, which allows you to vote at the Annual General Meeting. The Parkdale Village BIA was established in 1978 and represents the vibrant commercial strip along Queen Street West from Dufferin Street to Roncesvalles Avenue. The Parkdale Village BIA is 1 of over 85+ BIAs across the city of Toronto and is the voice of 440+ properties, commercial businesses and/or community organizations. 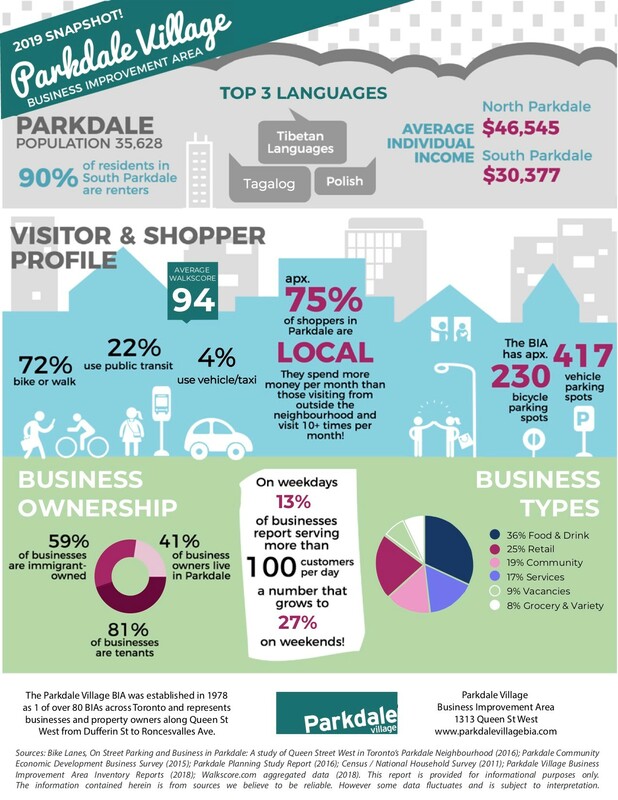 It is committed to improving and promoting the Parkdale Village area through investment and advocacy to maintain its position as one of Toronto’s premier destinations for shopping, business, and experiencing diverse culture and entertainment. In 2017, the BIA began it’s first step towards revising their Strategic Direction by surveying properties, commercial businesses and/or community organizations who fell within the BIA boundary (as defined by the City of Toronto). The feedback will help in redefining the BIA’s 2018-2025 Streetscape & Marketing Workplan priorities and identifying where we can add the most value on behalf of members. 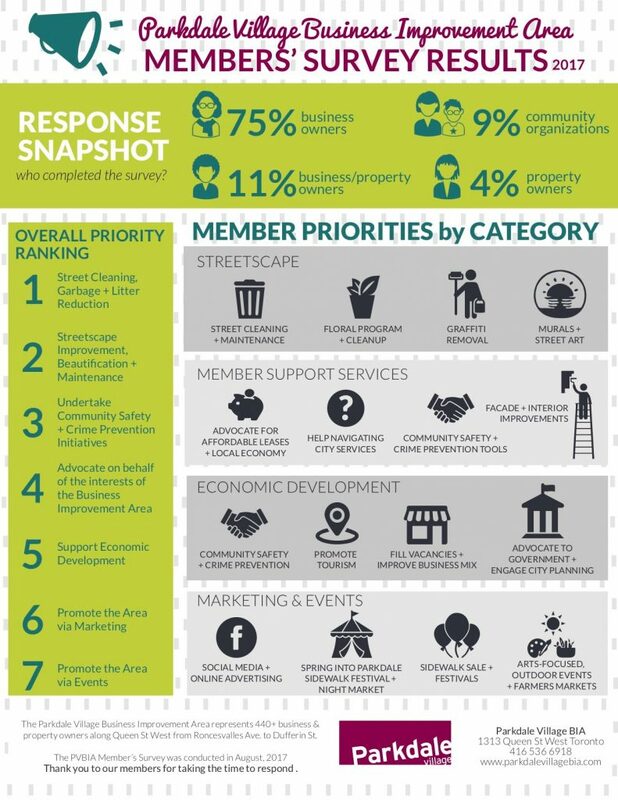 Click the PVBIA Survey Results Infographic for Survey Snapshot.